Enter our Pinterest photo competition! Where do you read in Wellington? 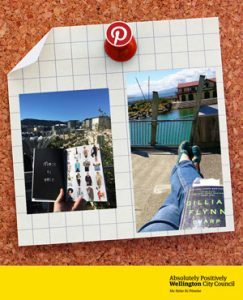 From 31 March to 26 April share photos of you reading in a recognisable place in Wellington for a chance to win an Instax camera (1st place) or a $50 Typo gift voucher (2nd place). Use the hashtag #WCLreads on your Facebook, Instagram, Tumblr or Twitter and the best photos will be pinned on our Pinterest board. This competition is open to all Wellington City Libraries members age 14 and up. Entries will be accepted from 31st March 2017 until 26th April 2017. Entries must clearly show both a book (or portion of a cover, or inside pages) and a recognisable location in Wellington to be eligible. Winners will be selected and notified by 3rd May 2017. Entry gives permission to Wellington City Libraries to display submissions in the libraries or on library webpages and social media. No payment will be made in any such case. Your contact information will be kept confidential by Wellington City Council and not disclosed or sold to any other party. It’s the 175th anniversary of public libraries in Wellington and for adults we have three competitions open until Monday 30 November which involve you using your knowledge of our library or literature. First up we have Book In A Jar. 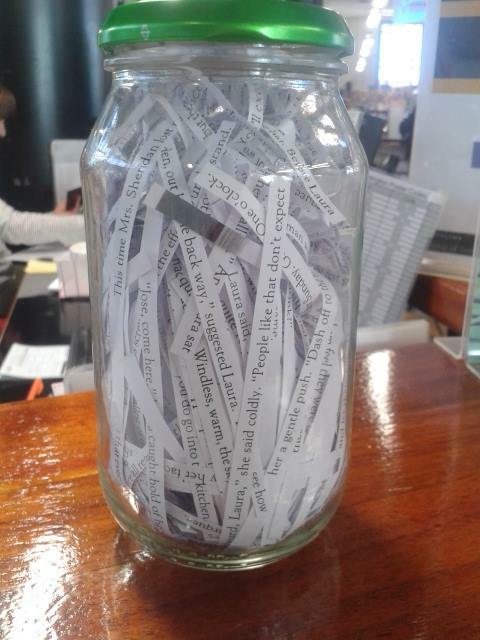 Drop by Central Library and take a look at lines of text in the jar. What book are these lines from? Tell us the book’s title by writing the title on a slip of paper and you’ll go in the draw for a $100 Booksellers voucher. Alternatively you can check out the picture of the jar at left, and email us your entry at enquiries@wcl.govt.nz . If you’re on Twitter you can DM us at @wcl_library, or message us on Facebook. Secondly we have How Old Is Our Oldest Book. What year do you think the oldest book in our collection was published? If you pick the right year, you’ll go in the draw for a $100 Booksellers book voucher. Email us or DM/message us at the links above to enter. Finally – if you think you know our libraries pretty well why not enter our competition : Which Wellington City Library Is That? Once you get all the questions right, you’ll go in the draw for a $100 Booksellers book voucher. For children aged up to 13 years, we have these two competitions running until Monday 30 November. Presents from WCL to you for our 175th birthday! To celebrate our birthday, we’re holding a party at the Wellington Central Library on Saturday 21st November. For the creative and crafty kids out there, we have a couple of competitions to enter. The colouring competition is for 5-8yr olds. New Zealand’s first public library was a small hut on the Wellington waterfront. Colour in the picture of the hut, fill in your details on the back, and drop it in to any Wellington City library to enter. The design competition is for 9-13yr olds. We want you to draw your idea of the library of the future! What do you think Wellington City Libraries will look like 175 years from now (that’s the year 2190, by the way)? Draw your design on the front, fill in your details on the back, and drop it into to any Wellington City library to enter the competition. We also have several competitions for adults – guess the book in the jar, guess how old our oldest book is, enter your memories of Wellington City Libraries, and spot the library by guessing which library is in the photos. Ask at your local library about entering the competitions, there are loads of prizes up for grabs! The competitions close on 29th November, and the winners will be announced on 1st December. 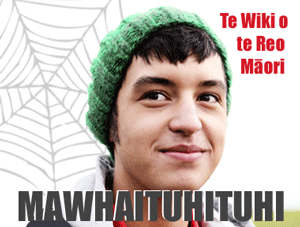 Māori Language Week – competition for teens! ComicFest 2014 this Friday & Saturday! Comics are fantastic – they’re visual, they’re literary, they’re fun, they’re for all audiences and on the 2nd and 3rd of May, we’re celebrating comics in a big way with our first ever ComicFest at the Central library. Wellington City Libraries have joined forces with GRAPHIC comic store to provide hundreds of free comic books on Saturday the 3rd of May, for kids, teens and adults. Free Comic Book Day, is an international event, celebrated across the comic reading world on the first Saturday in May, with the aim of promoting comics as a dynamic, modern medium, but also has the main and important aim of giving away FREE comics! We’ve arranged two drawing comics workshops with talented bro’Town designer and comic book creator Ant Sang and illustrator and Animation artist Gavin Mouldey. We’ve got author talks, the first involving Auckland’s comic supremo Ant Sang again, but Wellington’s own Grant Buist, creator of Jitterati and Robyn Keneally, comic book artist and creator of fab web comic Steve Roger’s American Captain: A diary comic. The second talk features Greg Broadmore, creator of the blackly funny ‘Dr Grordbort’ series and Paul Tobin, editor of the sci-fi, fantasy anthology ‘White Cloud Worlds.’ They’ll be discussing their comic-related work but also their projects for Weta Workshop. Check out the Weta Cave display items and props on Central Library’s first floor from the 17th of April! Don’t forget our comic book holiday activities, running through the holidays right up to International Comic Book Free Day on Saturday the 3rd of May. We’ll also be running a costume competition that day at the Central library and all are invited to attend, dressed as their favourite cartoony, comics-related character – prizes for best dressed kid, teen and adult. Get dressed up, get involved in our comics workshop, grab a free comic and (maybe) win prizes! 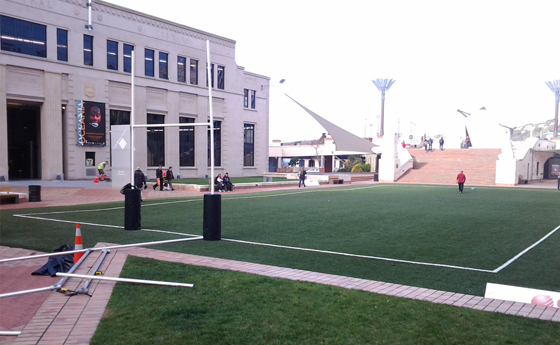 The Rugby World Cup kicks of tonight (you may have heard), also kicking off is the Wellington City Libraries Cup Diary. We’ll be letting you know what’s going to be happening in and around our libraries during the World Cup, highlighting some of the events happening in Wellington and providing the sort of in-depth rugby analysis you can only expect from true experts (maybe not that last part). Visit this blog for regular updates from the Cup Diary team and enjoy the matches! Enter our competition, match the numbered silhouettes above with the famous players they belong to, and you might be in to win our great prize, generously donated by Wellington City Council (RRP $200)! All you need to do is head over to our entry form page, choose from a list of possible players, and enter the number for your guess for each player. The winner will be announced on 30 October 2011. This gives you time to watch players in action during the World Cup! Good luck! 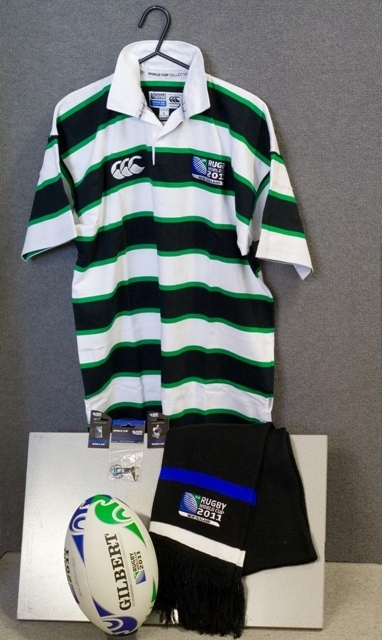 The Prize: Official RWC rugby ball, shirt, scarf, pins & keyring. We received a large number of very good entries in the competition and the Judging Panel of the Mills and Boon Writing competition were hard-pressed to choose a winner. After much debate and deliberation among us, and not knowing the names of the competitors, we chose the winning paragraph. Congratulations to Stephanie Gillbanks for a very fine entry! The judges agreed that Stephanie’s paragraph was vibrant, engaging and totally within the spirit of a Mills and Boon novel. We wanted to know what happened next! 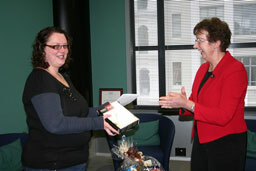 Stephanie wins a Sony e-book reader and a basket of goodies. With her e-book reader, she will now have the ability to download lots of romance e-books from OverDrive, and enhance her romance writing skills!! Thank you to all those who entered the competition. Writing competitions are hard work, and it was obvious that a lot of effort had gone into the entries. We thoroughly enjoyed reading them and could see that there is plenty of talent among our library patrons for writing romance novels! Stephanie has given us permission to publish her winning paragraph. The Girl who played with Fire is the second movie to be adapted from the late Stieg Larsson’s Millennium trilogy novels following the very popular The Girl with the Dragon Tattoo. Like that earlier film, this new release stars Noomi Rapace as Lisbeth Salander, a woman on the run and Michael Nyquist as the journalist Mikael Blomkvist, who is desperate to find her. This movie promises to be as dark and action-packed as the previous movie. What is the title of the third book in Stieg Larsson’s Millennium trilogy? Send your answer to Linda before 15th August 2010 to be in the draw.